"A month ago, my son fell sick and became very weak. He had once fought cancer even when he was just a 5-year-old. We never thought he had to go through it again. When I heard the word 'cancer' again, it hit me and I felt numb. He is now 14-year-old, how can I hide it from him? He is a smart child. His hemoglobin levels are very low and his eyes have become pale. He even faints because of this. I can't bear to see him going through this." - Sulekha, Mother. 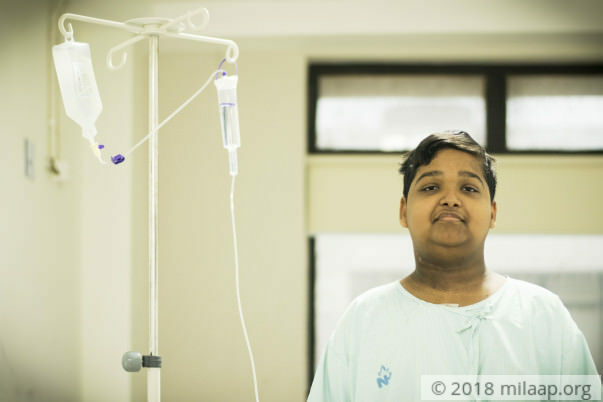 14-year-old Bikram Mondal is a bright student and he always had high ambitions; but now he is focused on one thing - staying alive. His dreams and ambitions have subsided. Getting healthy is all that exists. He fears death because he has excruciating pain that makes him very tired. He fears he might have to leave his parents and may not live to become a teacher, like he always dreamed. "He was diagnosed with cancer when he was 5-year-old and he was in the hospital for 3 years. Doctors said that he had recovered completely then. He went to school and he was doing well in his studies. Just a month back, he complained of pain in his waist but slowly it spread to neck and legs too. He became so weak and he fainted often. When doctors took a scan, they said that cancer has relapsed leaving us in despair." 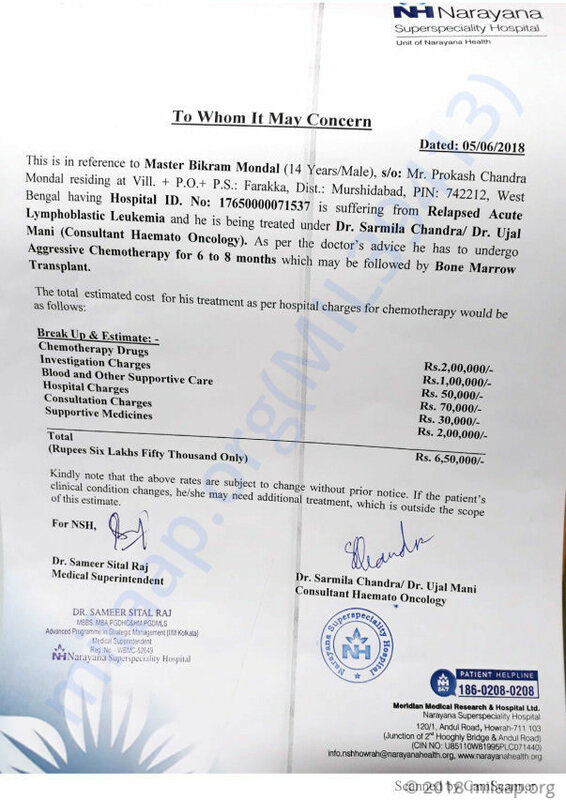 Bikram has been undergoing intense chemotherapy for the past one month. He needs to continue it for 8 more months. He is not able to bear the pain. He has fallen unconscious several times. The painkiller he takes can help for only for 2 hours. Then he again suffers the cruel pain.
" We tried to hide from him but he overheard the discussions in the hospital. He isolated himself from everyone. He doesn't talk to his twin brother also. Whenever he talks to him he begins to cry. He feels cut off from his school and friends completely. Whenever we take him to the scan room, he has to sit in a wheelchair and feels defeated. Only one person can stay with him, he refuse to move away from me so I'm with him and his father waits in the reception the whole day" - Sulekha. 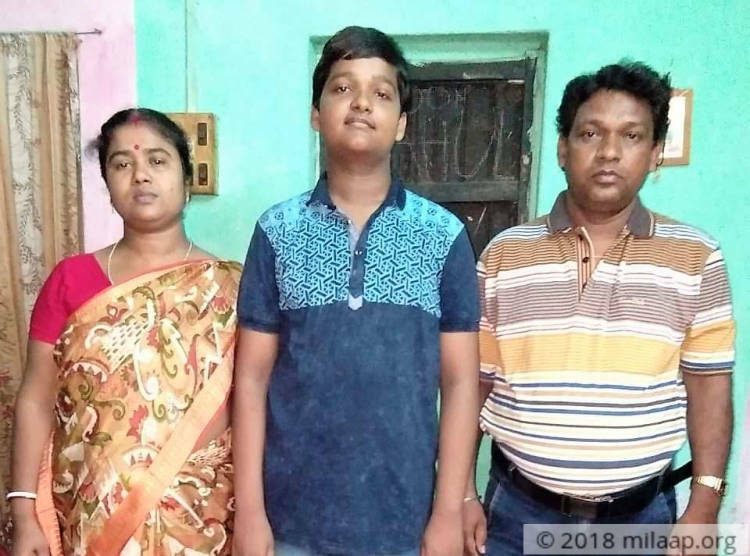 Bikram's parents Prakash and Sulekha live in a village in West Bengal. They have come all the way to Bangalore for his treatment. They consulted several doctors to get the treatment at lower cost. It was a huge decision for them to leave their home and job and move to a new place. But they are willing to do anything to save their son's life. 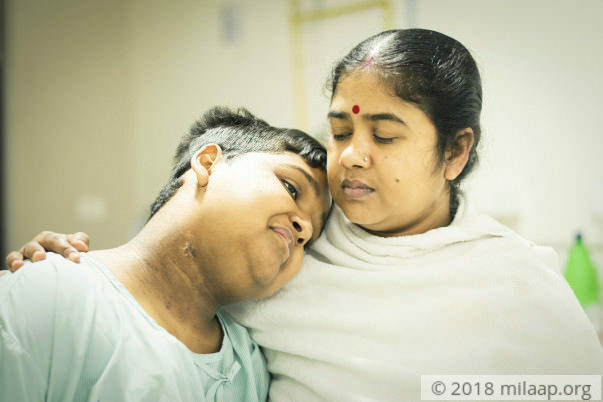 Bikram's twin brother Rahul is at his aunt's place whose husband suffers paralysis. Despite her poverty, she agreed to take care of Rahul. "My husband is a homeopathy doctor and he had a small clinic in our village. He was not earning much but we lived a modest life. We already borrowed a lumpsum for Bikram's treatment and haven't paid it back. Now we do not know whom to turn to help. Now we have no income - We have borrowed money from neighbours and I don't know how long we can survive on that. I need to save my son at any cost. I cannot imagine going back without him." - Sulekha. 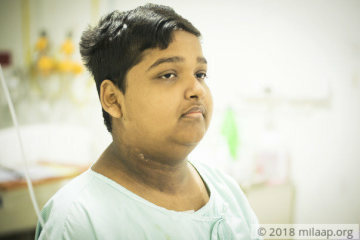 14-year-old Bikram has a high chance of recovery if he continues chemotherapy for 8 more months. This smart boy who aspires to become a teacher, is now filled with a fear of death. His parents are struggling to pay his medical bills. They have no one to help and are desperately waiting to take their son back home. His twin brother is waiting for him to come back. He needs your support to continue treatment without which he will not survive. 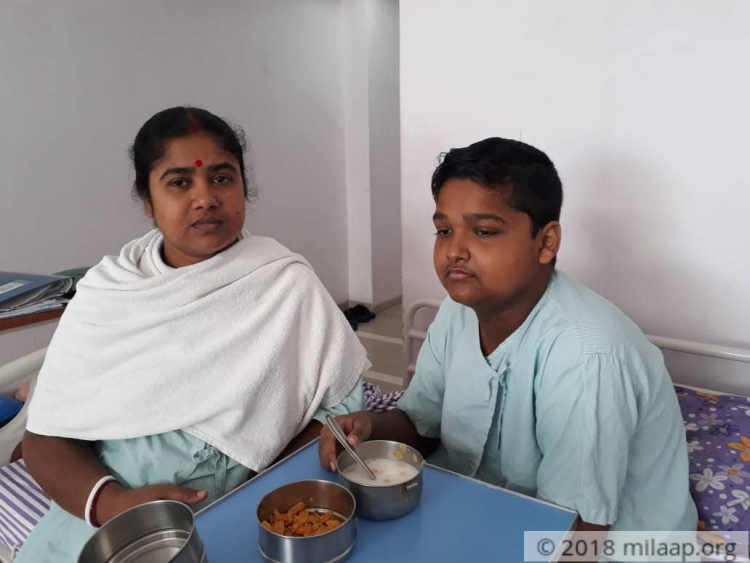 Your kind contribution can help 14-year-old Bikram to escape this dreadful disease and live his life! He needs to continue chemotherapy for 8 more months to survive. Please support him.